Students, faculty and staff gathered in the Bongiorno Center, about 10 miles from campus, for the Oct. 26-27 A Good Life? retreat. Joanne Adebayo ’21 (international business & management) was an RA, Writing Center tutor, First-Year Seminar writing associate, Innovation Competition student manager and committee member for Dickinson’s Women of Color Summit. It was a lot to balance, along with her studies, and it left little time for reflection. An overnight retreat gave her the framework, tools and support to identify the things that matter the most to her so she can focus her attention and time. Adebayo took part in Dickinson’s “A Good Life?” student retreat, held recently off campus. 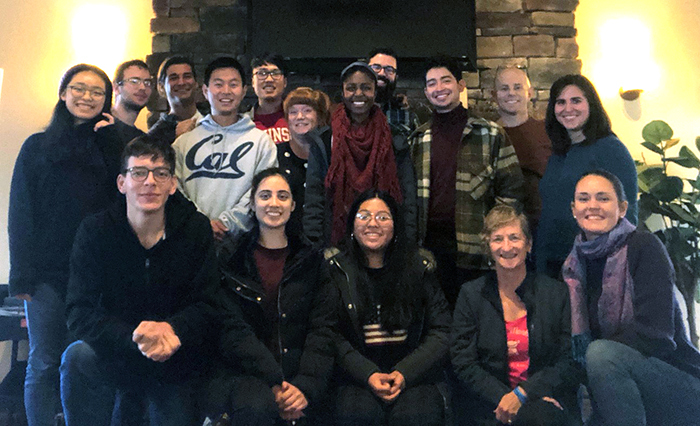 Two years in the making, this grant-supported, secular event was the first of its kind at Dickinson, giving 11 students an opportunity to come together and think about their values, ethics and life purpose, while discussing how they can live their best lives—on campus and beyond. “There’s not a lot of opportunity for students and faculty to think of purpose and meaning-making at a very deep level, so this was an empowering, in-depth experience that looks very different from a classroom discussion,” said Tara Vasold Fischer '02, associate dean of academic advising, who planned the event with Donna Hughes, director of The Center for Service, Spirituality & Social Justice, along with Anna Baldasarre, associate director of sorority life and leadership programs; Peter Leavitt, visiting assistant professor of psychology; Amy McKiernan, assistant professor of philosophy and director of the Ethics Across Campus & the Curriculum program; and Steve Riccio, lecturer in international business & management. Although the retreat was built around the theme of the second year of the Dickinson Four program—Discover What Matters—students from all class years were welcome to attend. They began with Friday evening icebreaker sessions, group discussions and a life-mapping exercise. The following day, Fischer helped students identify values and characteristics that are important to them and determine how these values and traits can influence the way they make decisions. Then Riccio led a session on big-picture meaning-making and decision-making. And after the students crafted a statement of purpose, McKiernan shared strategies for bouncing back when life does not go according to plan. The event organizers plan to use Leavitt’s surveys as a guide as they plan related events. Adebayo and Charlie Sachs ’21 (philosophy) recommend that fellow students consider participating.